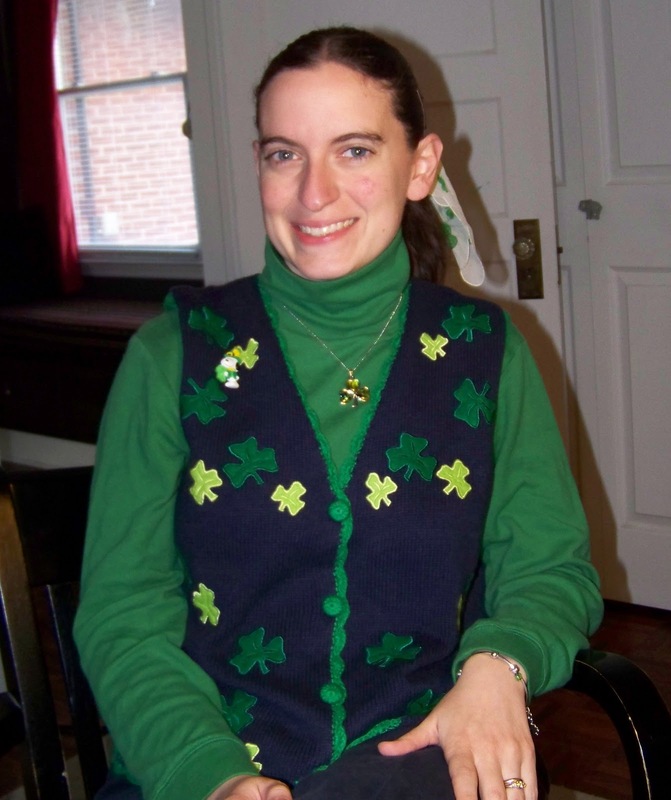 Carrie's Busy Nothings: Luck 'o the Scotch-Irish? Ever since I was a child, I have loved St. Patrick's Day. I can't put my finger on why that is as I'm not technically Irish enough to authentically claim it as a holiday which celebrates my heritage. We're some of those Scots who moved to Ireland prior to coming to America and are now branded as "Scotch-Irish". Once you throw in a good dose of our English ancestors (including a great-great grandmother from Lands End) and add a pinch of Cherokee to the family tree - well, we're basically good ol' American mutts from the great Melting Pot. Perhaps it helps explain why I'm an opinionated, quick-tempered, fair-skinned (i.e. I never tan, I only burn), brown-haired, blue-eyed Scot with a Cherokee nickname. This picture was taken back in 2009 - no pinching here! So yes, I'm a hopeless sap for St. Patrick's Day, but not in a green-beer-drinking, Irish-stew-eating, soda-bread-making sort-of way. I grew up with a mom who would dye the food green on St. Patrick's Day and made sure that we were wearing green so we didn't get pinched. I love the way we have created our own traditions to celebrate the holiday, including a yearly showing of Darby O'Gill and the Little People - how can you beat listening to Sean Connery sing?! "He'll regret it to his dying day, if ever he lives that long." "Sir, sir...here's a nice stick to beat the lovely lady!" Top o'the Mornin' to you too!! I LOVE the quiet man. My dad gave my husband a stick once and quoted that line...hubby had never seen it before and was HORRIFIED. It was hilarious. I think we should check our family trees, lots of similarities. I'm pretty well mutted up too! Have a wonderful St. Patricks day, one Scotts-Irish to another! Hahahahaha, man, I needed a laugh today and that picture of you all clovered out did it, lol! LOVE IT! I am ashamed and appalled to disappoint you, but nevertheless will reveal, that I had a/ never heard of a film with Sean Connery singing and b/ the gall to look the film up in Wikipedia just now to check if it really was him singing. And it wasn't. Check it here http://en.wikipedia.org/wiki/Darby_O'Gill_and_the_Little_People, the article in which we learn that indeed both voices in your clip were dubbed by other singers. Nevertheless, I am a sometimes reader of your blog, which often brings me much enjoyment!